You already have unchecked "Always show icons, Never show thumbnails" in 'Folder Options' and you also have checked "Show thumbnails instead of Icons-ON" and still you can't able see thumbnail pics in Windows & you are getting default program icons instead of a preview of thumbnails of what the video contains. but still facing the issue of VLC not showing thumbnails view of all video files in your PC. Many Windows users used to search; How do I get my thumbnails to show? Why VLC thumbnail disappeared from explorer? How do I view thumbnails? How to display thumbnail previews for video files? How do I restore audio and video thumbnails not showing in Windows 10? How do I view thumbnails in Windows 10? After troubleshooting with a system file check and with malware scan, I can say that it is NOT exactly related to 'Default File Type Associations' but with video libraries used with Windows Explorer. Even the process of Thumbnail Cache Clear and Reset not able to fix this error. If you are searching about video thumbnail not showing Windows 7, 8, 10 file explorer or about the video thumbnail maker or how to fix video thumbnails missing, then you are on right page. Stop searching for 'windows not showing thumbnail preview' or 'how to clear and reset thumbnail cache in Windows' or how to solve pictures do not display as thumbnail preview? Or solution for not all photo thumbnails showing & image thumbnails fail to appear? And check the quick solution to fix VLC media player disabling thumbnail previews on videos. Learn how to enable/disable thumbnail preview in windows file explorer & how to 100% fix all file type including .mp4, .mpeg, .avi & .wmv video thumbnails not showing in windows. Last time we have seen How to Play High-Quality Videos [HD] on Low Configuration Old [Slow] Computer. And today we are going see another tutorial to fix one another video thumbnail error in Windows explorer. The icon thumbnails of video files stopped showing the preview, it's only showing an icon indicating that it is a video file. It's not the error either with Windows operating system nor with hardware. You just need to alter the video libraries setting. Also, read; 5 Tips To Speed Up Windows Boot Time By ​‌‌‘​‌Turn on fast startup’ Option // Make Windows 10/8/7 Faster. Instead of thumbnails, all video files showing the default VLC icon while all other image files are showing proper thumbnails and only videos have the problem. I tried with K-lite Codec Pack and then Media Preview and then registry edit, but still, there is no success. I have also seen lots of users facing an error that the thumbnail images do not appear for downloaded videos and they looking to fix by resetting the thumbnail cache. 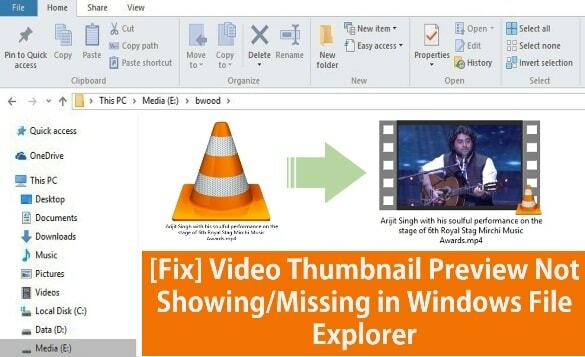 Just follow these steps and enable video thumbnails in Windows Explorer. 2. Install Icaros and open. 4. And now click on "Activate Icons". 5. Go to the video folder and refresh. 6. The problem has been solved. 7. Restart the PC, so setting gets saved. If you know any other way, then you can share with me via comments. I would glad to add it on this page directly.